John King, the son of two New York City public school teachers, has served as a high school teacher, middle school principal, the co-founder of a Massachusetts charter school, New York’s education commissioner, and U.S. education secretary under President Barack Obama. King now is president and CEO of the Education Trust, where he leads an organization dedicated to the academic achievement of all students, particularly those of color or living in poverty. His vast professional experience allows the graduate of Harvard University, Yale Law School, and Teachers College at Columbia University to see education debates from a wide range of angles. Personally, King points to the influence of the teachers he had as a child in New York City’s public schools. He credits them with saving his life after both of his parents passed away before he turned 12. In this ‘A’ Word conversation, he defends the importance of setting high expectations for all students, measuring to make sure that students are on track, and preparing educators with actions and interventions designed to support the success of all children. King also contends that the next phase of school accountability must go beyond rating schools and lead to better strategies for improvement. Anne Wicks & William McKenzie: How have you defined accountability in your various roles? And has that changed over time? 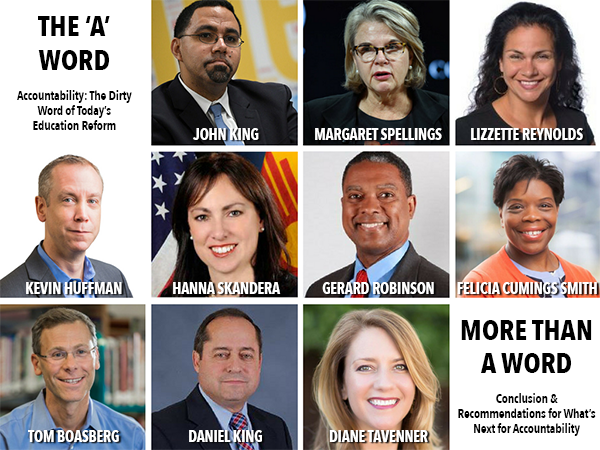 John King: Accountability is about a system of policies and practices that help the federal government, states, districts, schools, parents, and communities hold campuses responsible for serving their students well. One of the challenges is that just rating schools, identifying who is doing well or not, is not enough for a strong accountability system. A strong accountability system also has to have a strategy for improvement. I think of accountability as setting high expectations for all students, clearly communicating them, having a way to measure how students are progressing towards those expectations, providing feedback to all the policymakers and stakeholders, and then having a set of actions that are based on that feedback to improve outcomes. Has that definition changed over time? Over my career, going from being a teacher to being in the administration, I am ever more conscious of the importance of the improvement part of the accountability system, and making sure that folks are paying good attention there. As a teacher or principal, you’re always eager for information about how your kids are doing, whether they’re making progress, and how they’re doing relative to other kids in the state and in the country. And you have your own strategies for how to respond to the gaps. But too often districts, states, and the federal government don’t have adequate strategies and supports when schools are identified as struggling. My attention on that school-improvement component certainly has increased. You started as a teacher. How did accountability affect your decisions when you were in the classroom? I taught in Massachusetts when the Massachusetts system of higher standards and accountability was first being put into place. I saw it as a tool to better understand where kids were and what they needed to be prepared to graduate from high school and be ready for what’s next. I saw assessment as a tool for instruction, but also as a way to help the state identify gaps and direct resources to where kids needed more support. How did accountability principles or practices shape your decisions as a charter school leader? One thing that appealed to me about charters was that charters were going to have more autonomy in exchange for greater accountability. One of my concerns as an educator was that in too many places there was not necessarily clarity about the ends, but there were a lot of prescriptive requirements about the means. The target was sort of vague, but there were lots of requirements around how the school day would work and what kinds of experiences kids and teachers were having at school. That is actually backwards. There should be a much clearer consensus around the target, and then much more flexibility for educators at the school level to innovate towards better outcomes. I became a charter principal, started at a charter in Boston, with the goal of trying to improve outcomes for low-income students of color in particular. The school was in Roxbury in Boston. In Roxbury, less than 10 percent of adults have college degrees, and the academic outcomes for students are very low relative to Boston or Massachusetts. Our goal in creating Roxbury Prep was to radically improve those outcomes. As a charter, we had a performance agreement with the state. We were going to ensure that our students were on the trajectory to college success, or we would lose our charter. I liked that high degree of accountability with the freedom to hire the staff we wanted, create the schedule we wanted, structure the courses and school year the way we wanted, and to create the school culture we wanted. I thought of that as the right exchange, and we got great outcomes and became one of the highest performers among schools in the state. My involvement in developing more charters like Roxbury Prep grew out of the fact that the autonomy-for-accountability exchange could be a lever to create better outcomes for kids. 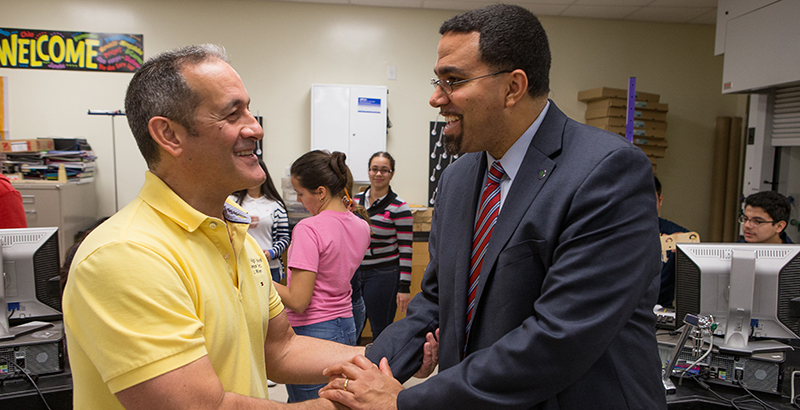 How did accountability principles or practice influence your decisions as secretary of education? In the Obama administration, we were very focused on identifying and investing in evidence-based strategies to improve outcomes. In many ways we were able to build on the foundation of No Child Left Behind, where we could see where the gaps were for low-income students, for students of color, for English learners, and for students with disabilities. We worked with Congress to reauthorize the Elementary and Secondary Education Act. That turned into the Every Student Succeeds Act, where we tried to strike the right balance between a high degree of state flexibility and clear civil rights guardrails. The guardrails included annual assessments imposed through each grade, transparent reporting of the results, and disaggregation of data — which was a really important feature of No Child Left Behind that we wanted to protect. And we wanted a responsibility for states to act when schools are struggling, or when schools are struggling in serving particular groups of students. To flip this around, what limited your ability to implement accountability practices and policies in your work, either as a teacher, charter-school operator, or education secretary? Two things. One is there are a series of adult arrangements that are, to my mind, disconnects from the interests of students. Whether it’s at the district level, the state level, or the federal level, a lot of energy and time is consumed negotiating the terms of those adult arrangements that ought to be spent on helping students get better outcomes. In many places you could identify that English learners were struggling, but there was not the flexibility to direct the right level of resources to those English learners to ensure that they had teachers who were well-trained and effective in working with English learners. The second challenge is those of us who care about educational equity have not yet been successful in building a strong amount of movement around educational equity. In too many places underperformance is not only tolerated, but assumed. I can think of a district in New York, where I was the state chief, where the percentage of kids who were proficient was in the single digits. There ought to be outrage about that; folks ought to be marching in the streets. Yet in a lot of places people say, “Well, the kids are poor, or there’s challenges in the community, or they’re from single-parent households, so what could you expect?” That added to the assumption that kids who have challenges outside of school can’t learn. What should parents, taxpayers, and the general public know about those “adult arrangements”? It’s a whole variety of things. It’s the fact that in many schools around the country teachers come back to school the day before kids come back. If you think about the planning that you want educators to be doing, the analysis of their incoming students’ prior work and learning needs, it’s really hard to imagine how that all happens in one day before the school year starts. But that’s a result of decisions that have been made by management about how to organize the school calendar. When I was in the charter sector at Roxbury Prep, we had teachers come back three weeks before the start of school so we could use that time to plan, focus on what our students would need, and make sure that we were as ready as possible for a great school year. We were only able to do that because of the flexibility to do so. In many schools that serve our highest-need students, they get less. They get less effective teachers. They get less access to advanced coursework. They get less access to school counselors who will help them make the postsecondary decision. And those are all decisions that are made in school board meetings and district offices about what’s convenient for adults, what adults need, whatever the folks feel like is the way they’ve always done things. It is that way rather than starting with what students need and making sure that the highest-need students actually get the strongest teachers and access to a full range of opportunities. Let’s circle back to using accountability to lead to strategies for improvement. Would focusing on that help us build stronger support for accountability? I think so. Part of the political problem around accountability is that it sometimes feels to educators and the community that the message from the state or from the federal government is, “We’re going to use this accountability system to tell you you’re bad or that your school is inadequate, and tell you that you’re a D or an F.” And somehow knowing that is going to be so motivating that outcomes are going to change. Now, that may mean that there needs to be a change in the behavior of the adults in the school. It may mean there needs to be a change in some of the adults in the school. It may mean there needs to be a leadership change in the school. It may mean new programs are needed that are more responsive to the needs of the students in the school. But if folks understood that with the labeling would come support and intervention, I think that would help build credibility for accountability systems. What else do you think would help build credibility? People have to know that assessments are good. Accountability systems are highly reliant on state tests. They have to know that the state tests are good and reflect the kinds of skills that students will need for success in college and careers. We’ve made progress on that front over the last decade. Many more states are focused on college and career-ready standards. They’re building into their state tests more opportunities for students to write, more opportunities for students to do problem-solving, more opportunities for students to demonstrate the ability to critically analyze text, which is an essential skill for success in postsecondary education. We’ve made progress, but there is still this gap. People don’t trust that the assessments are giving the right information. I think most people would say, “Yes, it matters how to do an annual assessment, but other things matter too.” The Every Student Succeeds Act gives states the opportunity to look at what those other things might be, like chronic absenteeism. Those additional elements will help build the credibility of the accountability system. They will build confidence that we’re looking at more than just test scores, that as a society we are also looking at the other hard questions that affect life outcomes for kids. If you were king for a day, what would your perfect accountability system look like? I don’t know that there’s one perfect system. But some of the features of a strong system are: high standards that reflect college and career readiness; high-quality assessments that build in real-world tasks that reflect the kinds of things students will need to do for college and career success; annual indicators of students’ progress; attention to both whether or not students are proficient, because we have to understand that; and whether or not they’re making progress. The precise details may vary. I don’t know that there’s one perfect way to weigh those things, but we want parents, communities, and educators to understand whether or not kids are genuinely on track to college and career success. But you also want them to understand if they’ve made progress in the last year. There needs to be attention to how all groups of students are doing, so we can’t just look at averages, which sometimes mask how African-American students are doing, or Latino students, or English learners, or students with disabilities. There’s got to be a requirement that once you’ve identified gaps in performance, there’s going to be meaningful action on the part of the school, the district, the state to try to address those gaps in performance. If those meaningful actions are not successful, then even more ambitious interventions will be deployed. There has got to be a sense that the accountability system leads into progressively more ambitious interventions to ensure good outcomes. There’s got to be a backdrop of adequate resources, so that folks feel like the system is fair, and that their school and classroom have a fair shot if they do well. In this era of local and state control, what should we expect of state leaders, district leaders, even school board members when it comes to ensuring all students have the opportunity to learn and succeed? At the federal level, I would like the federal government to provide meaningful civil rights guard rails if states submit their Every Student Succeeds Act plans. The federal government should require states to change their plans if they aren’t holding schools accountable for how groups of students do. And they should hold them accountable if they aren’t proposing meaningful interventions that ramp up in ambition, depending on whether or not the school makes progress. At the state level, leaders have a tremendous opportunity under ESSA to set ambitious targets for the progress that groups of students will make. Then, they should build evidence-based strategies to address areas of underperformance. And they need to be creative and ambitious in how they think about using teacher professional development dollars to help make sure that teachers have the skills and supports to close opportunity and achievement gaps. State leaders are in an incredible position to make a huge difference for kids. At the district level, there needs to be a commitment to work urgently to close achievement gaps. There needs to be a commitment to make sure that the resources are getting to the highest-need students. In too many districts, more affluent students get more resources in their schools. The goal really should be that the highest-need students get more resources, so that they have an opportunity to succeed. And then at the school and classroom level, people have to see data about student performance as a tool for continuous improvement, and not as a “gotcha” exercise. They should see data as a resource to use to help students improve. What is at stake for us as a country to get these issues right? The majority of kids in our public schools are kids of color. The majority of kids in our public schools are participating in a free- and reduced-price lunch program. We have no future as a country if we fail to educate African-American students, Latino students, English learners, low-income students, students with disabilities. The future of our economy and our democracy depends on providing an equitable education to all of our kids. Is there anything that you want to say about this topic that we didn’t ask? There are fair critiques of No Child Left Behind, but we have to remember what the landscape looked like before No Child Left Behind. There were states where English learners were essentially invisible. Their performance wasn’t included at all in how states and districts thought about student performance. There were places where people were in complete denial about achievement gaps and didn’t recognize and grapple with the fact that low-income students, students of color were performing at a very different level. There was a sense in many places that there was a lack of urgency about improving performance. No Child Left Behind was imperfect, as all laws created by men and women are, but the law created a very different landscape, where now we are attending to achievement gaps in a very different way. We are making sure that all kids and the performance of all groups of kids now can be visible. We can act on that information to make improvements and, hopefully, give states an opportunity to build on the strengths of No Child Left Behind, even as they address some of the weaknesses and gaps.